I've been looking forward to getting my hands on the new release of HIGH MOON by papercutz and it just arrived in time for some Halloween reading! Written by David Gallaher and illustrated by Steve Ellis, papercutz has brought the acclaimed graphic novel series and web comic back to print. Originally created as a weekly online comic strip then later published in 2007 by DC's Zuda Comics imprint, HIGH MOON combines a wild west adventure with a monstrous horror story. Papercutz specializes in graphic novels for children and teens but is publishing HIGH MOON through its Super Genius subsidiary that distributes titles that are a bit more artistic and edgier for more mature audiences than its parent company. 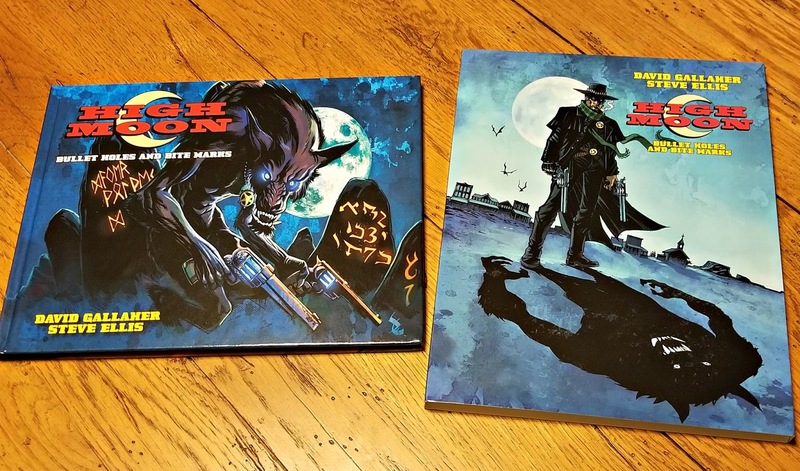 The first volume in a three part series, "HIGH MOON: BULLET HOLES AND BITE MARKS" is being released on Halloween at book stores and comic shop across the United States including Amazon.com. Volume 2 is scheduled to be released next May and the final graphic novel of the trilogy will follow that at a yet to be determined date. The artwork for the first two volumes has been remastered from previous publications and volume three with all new material. All three graphic novels feature brand new cover artwork by Ellis. The Super Genius editions of HIGH MOON are printed on larger paper stock than the previous publications by Zuda Comics, but still maintain the landscape format of the original series. The landscape layout provides a nice panoramic view of the content that enhance the movie like feel of the material you are reading. 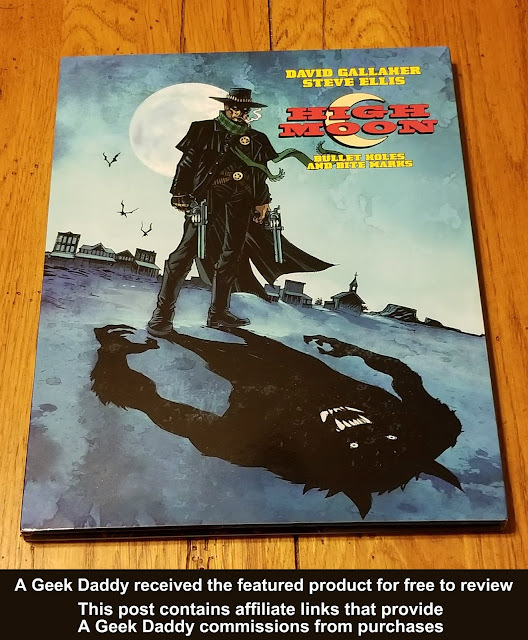 Super Genius' HIGH MOON graphic novels include a removable slipcase which is nice for being able to vertically store and display on a book shelf. I'm a fan of Gallaher and Ellis work and really happy that Super Genius is bringing their Harvey Award winning story back to print so it can be added to my bookshelf of favorite graphic novels. HIGH MOON follows the investigations of a mysterious bounty hunter who has his own dark secret that emerges every full moon. This gritty series does an excellent job of taking the elements of a horror flick and action movie so they play out on the pages of a comic book for an incredibly engaging reading experience. 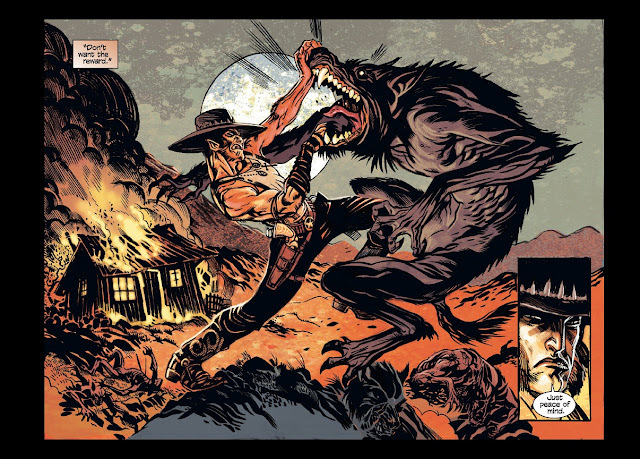 A terror-ific story about cowboys and werewolves in the Old West! Gallaher's script makes reading the book as interesting as looking at its illustrations....and the artwork by Ellis really is amazing! One of the best graphic novels you can pick up this year! Add reading HIGH MOON: BULLET HOLES AND BITE MARKS as part of your Halloween celebration by purchasing it on October 31, 2017. The graphic novel is available as an e-book, paperback and hardcover edition from Amazon.com.